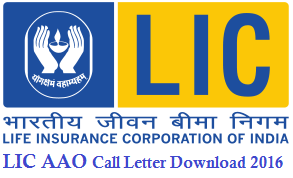 LIC AAO: Life Insurance Corporation of India Assistant Administrative officer’s Call letters downloads from the Life Insurance Corporation of India official website www.licindia.in, LIC AAO Call Letter is the entry ticket of LIC AAO Exam 2016. Candidates must have the LIC AAO Call Letter at time of Entrance Exam, and also candidate’s details like any name mistakes or any other on the call letter. People can download their LIC AAO call letters from the Life Insurance corporation official website, one week before the LIC AAO Exam. LIC AAO Exam will be conducted the First week of March, and the will held in the Form of Online Mode, LIC AAO Online Exam dates tentatively 5th, 6th and 13th of March 2016. At the time of Examination candidates should carry the LIC AAO Call Letter for reorganization. After candidates have to fill the correct details of their own. Then Click on Download, and get the Print out of the LIC AAO Call Letter. Life Insurance Corporation of India was published the recruitment notification for 700 Assistant Administrative officers to full fill the vacancies within the branches of LIC. Life Insurance Corporation of India was invited application from the eligible Indian citizens who want to work with LIC – Life Insurance Corporation of India. This LIC AAO Official Recruitment Notification was published on the Life insurance Corporation of India Official website, on the Career page. And they requested to candidates have apply through ONLINE mode only, no other mode will not accepted. And the LIC AAO Exam Fee was Rs. 100/- for SC/ST/PWD Candidates and Rs.600/- for all other candidates.